I am a huge fan of horror, and Dawn Kurtagich is one of the best in YA horror. 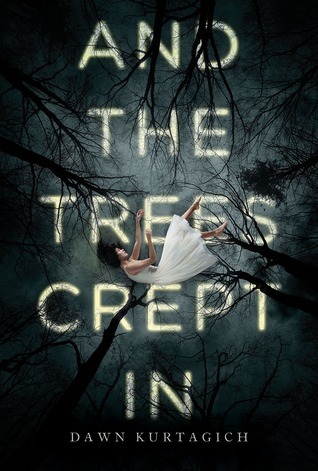 I adored her first book, The Dead House, so And the Trees Crept In was a no-brainer for me. While I did enjoy the story very much, I can say that I was a little disappointed in one way..... it wasn't nearly as scary as I was hoping for. After arriving at La Baume, a secluded mansion far from their London home, Silla and Nori feel like they have finally escaped. They are free from their abusive father, and weak mother, and finally living in a home where they are loved. Their Aunt Cath is silly and fun, and so happy to have them there and they feel free. Unfortunately, the fairy tale ends all too soon. Aunt Cath changes drastically, almost overnight. She disappears to the attic, leaving Silla and Nori alone to fend for themselves. Silla is trying to hold everything together for Nori, but the garden is dying, all of the food disappearing. The worst part though, is the trees. They seem to be coming closer to the house. And Silla can't stop thinking about an old story (Crazy) Aunt Cath told them once, long ago. A story about The Creeper Man. Is he here? Are the trees really coming closer? Is the house sinking? Or is Silla going crazy, just like (Crazy) Aunt Cath? Let me start by saying this... Yes, I was disappointed in the lack of horror elements, BUT I still loved every minute of the story. Silla was a fantastic character study, and the perfect unreliable narrator. I loved her as a character, even when I just wasn't sure what to believe. Nori was a shining light in the book, and though she didn't get a lot of page time, her presence was always felt. Everything Silla did was for her, and the reader is well aware of that. There is a sweet romance in the story, with whom I will never tell, but it added another element of doubt and depth to the story. The way that Kurtagich weaves this character into the book, especially towards the end, was magical. All of the relationships in the book were crafted beautifully! And the Trees Crept In has definitely cemented this authors place in my Must-Reads list. If you are a fan of dark, gritty stories that are sometimes a struggle to read, this is one for you. Add in some creepy, and it is a great October read! Oh wow! Sounds really creepy! Perfect for October. All my life the only horror stories I've read are Goosebumps! Recently I've taken to reading Horror novels. This seems to be a really good read for a starter horror reader like me :) Not too scary! Great Review Jamie! Sounds like this would be good if you know what you're going into with the right expectations, which makes your review really helpful. I haven't read any of Dawn's work yet but I'm hoping to this Fall. Thanks!